The extensive DT range includes more than 500 different drive belts and, in addition, matching components, such as belt tensioners, tensioner pulleys and (belt) pulleys. Due to compliance with high tolerance accuracy and regular monitoring during production, DT V-belts with AVX profile can be used in sets. Because of their precise profile, narrow structure and extreme flexibility and elasticity, DT V-belts with PK profile fit perfectly to the ever closer adjacent auxiliary units of modern engines. In addition to the AVX V-belt sets, the DT brand also offers power belts which are made specifically for long transmission distances and where, due to the aggregate arrangement in the vehicle, strong vibration may occur. DT® Spare Parts power belts are firmly connected drive belts and banded by a cover plate, so that the belts remain tear-proof, even in extreme performance situations. Drive belts of the brand DT® Spare Parts are characterised by high power transmission, low vibration and quiet operation. This result is achieved by regular monitoring of the accuracy of the profile during production and a tight length tolerance of max. +/– 5 mm. 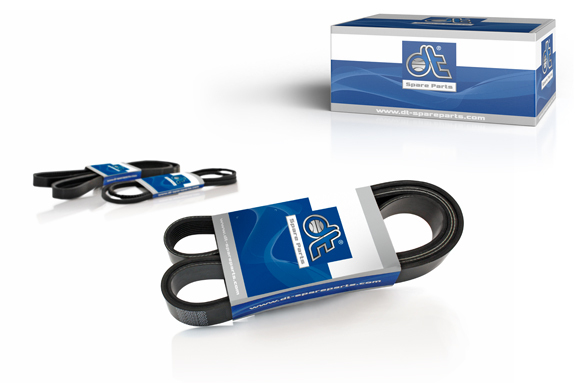 A long service life of DT® Spare Parts drive belts is guaranteed by the use of high-quality oil and temperature resistant materials, which prevent the belt from tearing and becoming porose, even at extreme temperatures of –40°C to +120°C.